1. Dynotuning allows you to dial in and take full advantage of modifications done to the your vehicle. 2. 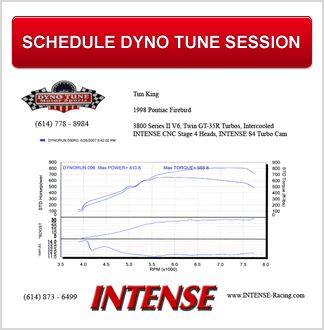 Dynotuning allows you to verify exactly how much power you gain with each new modification. 3. Dynotuning allows you to log data from the PCM to see if any sensor is failing or if a potential problem exists. 4. Dynotuning is a safe and legal method of tuning in a controlled environment. 5. We're able to determine the ideal fueling and timing for your particular car. 6. We're able to test pulley size change versus ignition timing to see what works best. 7. We're able to view and print your before and after results. These can be shown off on the internet and/or used in car shows. 8. We're often able to trouble shoot mechanical and/or electrical issues. For example, Tom Thacker had ignition misfires and gained ~ 15 WHP when we recommended replacing his spark plug wires. Derek Davidson had an incorrectly installed camshaft, and gained ~ 110 WHP when it was corrected. 9. All mail order PCM tunes must be set up conservatively. Fuel and timing needs can vary from car to car. Mail order tunes can not take full advantage of your car modifications for this reason.